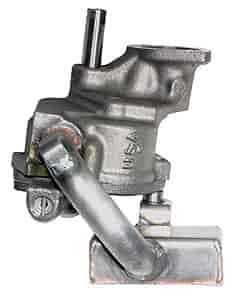 Package includes the Moroso pickup welded to the oil pump for a simple bolt-on installation. The pickup orientation ensures .250" clearance from pickup to bottom of any Moroso oil pan. The oil pump has no internal modifications. Moroso package includes the pickup factory welded to the oil pump for a simple, bolt-on installation, ensuring optimum .250" clearance from bottom of pan. High-volume Oil Pump provides up to 25% more oil to provide superior lubrication at higher engine speeds. Precision bent for precise fit. Wire mesh screen traps debris without restricting flow. Use with heavy duty Moroso Oil Pump Shaft P/N 710-22070 for Small Block Chevy and 710-22080 for Big Block Chevy or other similar hardened steel drive shafts with steel sleeves.